2009 Holiday Gift Guide - Mom Knows It All. Mom Knows It All Holiday Gift Guide has just launched with the hopes of helping families to get ready for the holiday season. 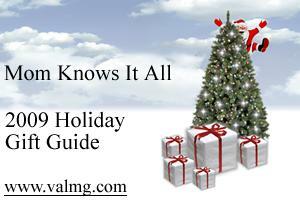 The guide will contain family friendly gift ideas for all ages and all budget ranges. Products will come from all categories and price points. Visit often because the gift guide will be a fluid one, meaning that items will be listed individually and in one central location on the gift guide page. A number of companies have generously offered to sponsor giveaways as well. Have products that you would like considered for inclusion? Will you be sending a sample? Would you like to sponsor a giveaway of the product? Openings in the guide are still available in categories including toys, games, tech, gadgets, home and clothing. Non-returnable samples will be accepted and encouraged. Providing a sample does not guarantee inclusion in the guide but will give it a much better chance since I will have been able to personally try/test it out. Products included in the guide will be able to have a discount code offered if you choose. Each item will clearly state if I have reviewed it or not, and will contain information on pricing and where to purchase. I am thrilled to have worked with companies such as Walmart, Oreck and more. If you have products that are food related, please check out From Val’s Kitchen.